Welcome to my website! I specialize in restoring some of the best amps known to man. 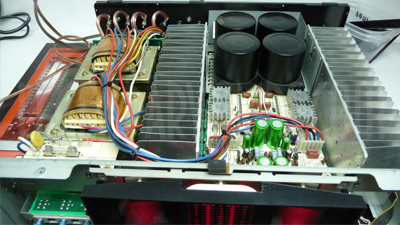 Here you will find information about how and why I restore these amps. The reason I restore these amps is that they are no longer produced and to be able to duplicate their sound today with available components would be hard pressed. The quality of these amplifiers at their introduction in the 80's was well ahead of their time. The engineering and the level of quality components used were unsurpassed then and are certainly unsurpassed by today's standards. To replace this amp with what is available today, one would have to spend upwards of $20,000 to $25,000 to duplicate these amps' quality of sound. I have worked on Macintosh, Carver, and many other high-end amps and even spoken to their engineers, many who actually own these rare Yamaha amps. They will admit, in private, how good these amps are. What is the average restoration turnaround time?